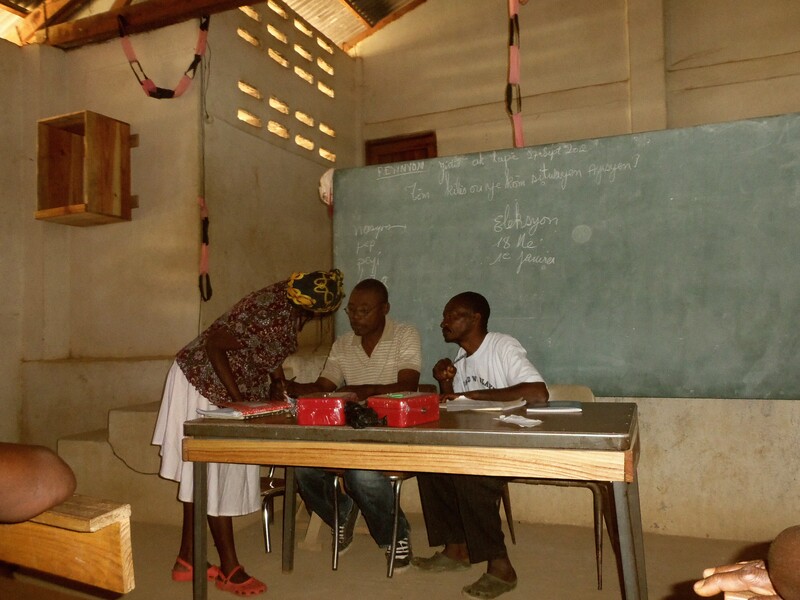 Over the past 18 months Solisyon Kominote Yo formed 14 savings groups (CAF’s) which include over 300 individuals in communities around Ouanaminthe including Bois de Laurance, Caris, Mont-Organize, Savanette, Dousmon and Hout Madeline. CAF’s are community banks self managed and self financed by it’s members. In other words the group acts as small independent bank financed and managed by its members. The groups have on average between 15 to 30 members and their key to success is TRUST. In Haiti very few people have access to formal banks, and when they need to save or borrow money they there are not many places where they can go to, especially in the countryside. In many remote rural communities moneylenders who charge from 25% to 50% interest are the only way to take a loan. To this problem CAF groups are a very simple and rapid solutions. To start and run a CAF is needed only few hours of training after which the group is ready to start saving. At the beginning the members are establishing the rules which by in large include: the value of interest rate, value of late fees, shares values, meeting day etc. During the meetings some members save money, others pay back their loans, when others are taking loans. The loans are usually invested in small businesses (mom and pap stores), paying for children’s education, health care emergencies and agriculture. The opportunity of saving and borrowing is creating economic and financial stability for the members, their families and the community at large. Taking a loan involves paying interests based on an interest rate that varies from 2% to 5% usually. This creates a surplus of money in the specific CAF, which is divided among the members at the end of the year. In this way CAF members feel that even though they pay an interest, this money will get back to them directly, because it stays within the community. This contrasts with finance institutions. The majority of CAF members are women (70%) but there are males as well. The meeting takes place once a month usually during the weekend, let’s say on the first Sunday of every month, a date easy to remember. The meeting is not only a “trip to the bank” but also an opportunity for networking and escaping the everyday routine. Another important value of CAF’s is “community spirit”. All the members know each other very well and they are aware that only together they can advance. This is reflected in the names they give to the groups such as “All together”, “Solidarity”, “Light for life”, “Hope”, etc. As an example in September / October all the members need money to send their kids to school, buy uniforms, pay school fees and school supplies, however they know that the money they saved are not enough for everybody. For this reason they came up with a plan so that everybody can take a loan starting gradually from June. Once again this is a proof that grassroots activities, together with collective efforts and understanding, are the key to advancement and progress. Till this moment the groups pulled together US$ 6,000 in savings, which allowed the members to take up to 700 loans which have a cumulative value of US$ 20,000.